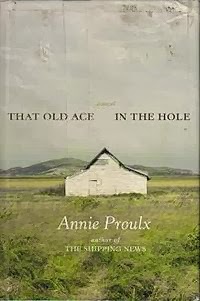 Although set very far away from the Newfoundland of The Shipping News, the book that introduced me to Annie Proulx's sparkling prose and engaging storytelling, That Old Ace in the Hole (2002) shows some parallel to the earlier novel. The protagonist, Bob Dollar, is a shy man confused about his place in the world, who finds himself transplanted into a new environment full of interesting characters and rich in local customs and stories. Adding to his clumsiness there is the fact that he is on a mission — to buy land to establish a hog farm— opposed by many of the same people that also show him kindness. Bob settles in a rough bunkhouse in Woolybucket and helps out at the Old Dog Cafe. There are no recipes in the novel, but many dishes are mentioned and I hope that some elements of the story will inspire you. Above all, I hope that you will enjoy following Bob Dollar's adventure in the Texas Panhandle. When you publish your post (or posts), you can leave a comment to this post or email me at simosite AT mac DOT com. Feel free to write a comment or email message, should you have any questions. 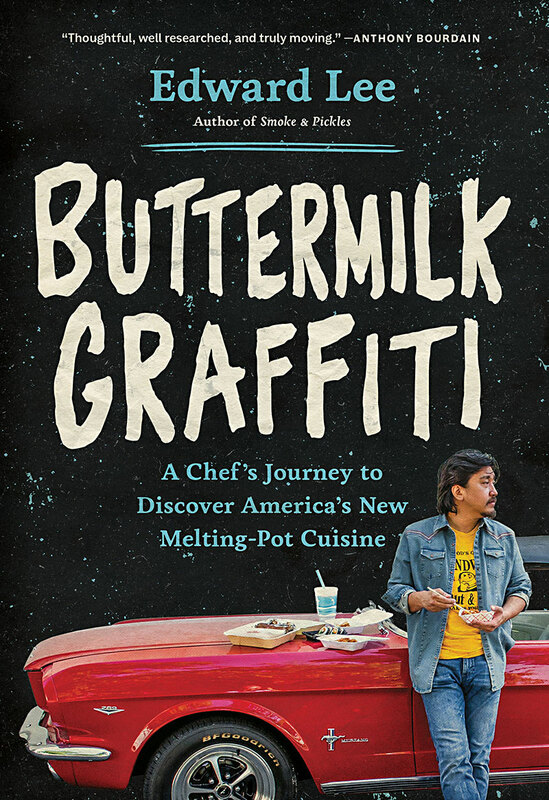 Thanks to all who participated in the August/September round of Cook the Books. This was my first hosting gig and I appreciate you all reading A Thousand Days in Venice by Marlena de Blasi with me. I was awed by the cuisine that was created. I spent, though not a thousand days in Venice, time enough to understand her appeal. Yes, I wrote 'her'. Venice, the Dame. La Serenissima. The most serene. There is something magical about an entire city that exists on the water. I loved how Marlena allowed the "stranger" to sweep her away. I also loved how, being more mature, she had limited expectations of what a move to Europe would mean and was only slightly disillusioned by the whole thing. I loved all her experiences at the market place and I felt for her trying to live without all the conveniences with which she was accustomed. 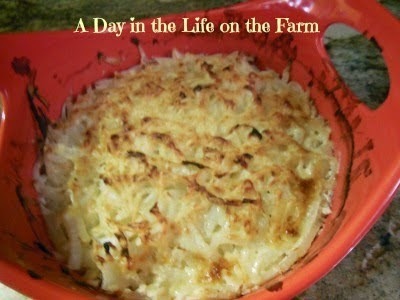 Wendy was inspired to make Porri Gratinai (Gratin of Leeks). Wendy used onions and served this dish up with grilled steaks. Simona from briciole (one of the other co-hosts of CTB) has also visited Venice and you must go to the post to see her wonderful photographs of the gondolas. 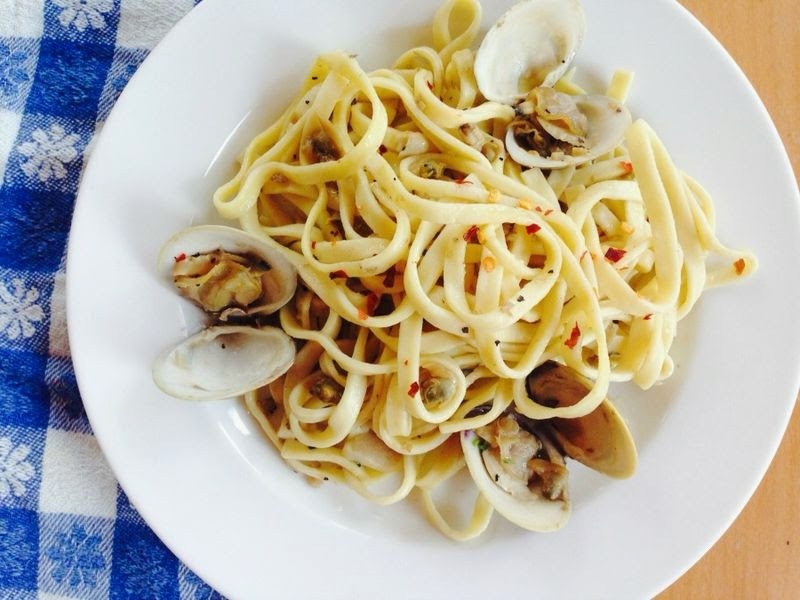 Simona was inspired to make pasta, but not just any pasta. She made nodi (knotted pasta). In Italian, to get married is sposarsi. We don't use the metaphorical expression "to tie the knot" (literally, fare un nodo). 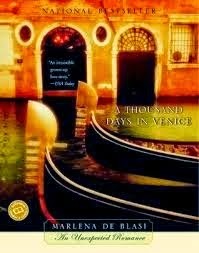 The current selection of our Cook the Books, A Thousand Days in Venice in which author Marlena de Blasi talks about her marriage to a Venetian man, brought to mind the expression. 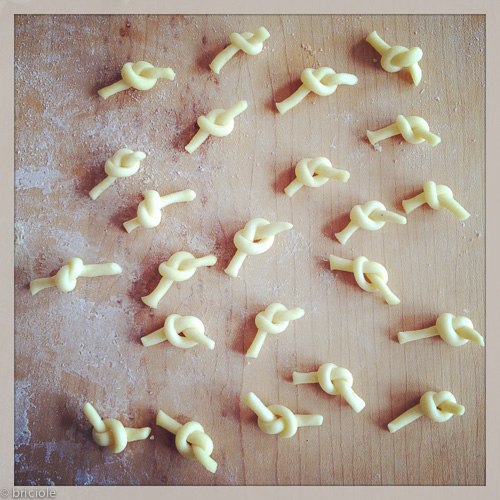 My passion for turning pasta dough into interesting shapes did the rest: I tried to tie pasta dough into small simple knots and the result was pleasing. Amy from Amy’s Cooking Adventures is the newest member of CTB. Welcome! Amy was more inspired by Venice than the book. 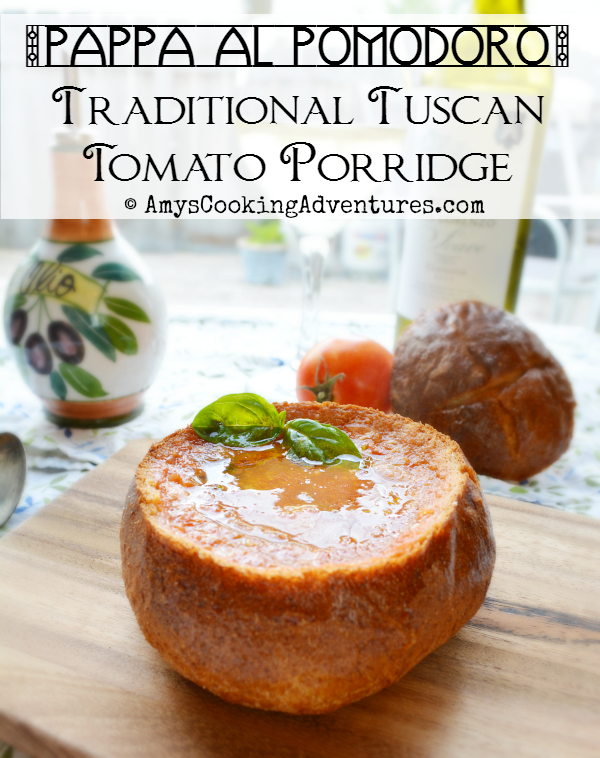 Nonetheless, she whipped up a keeper of a dish, Pappa al Pomodoro, putting a twist on di Blasi’s recipe and serving it up in bread bowls. Since we are nearing soup season, I am definitely keeping this in mind. An exuberant American chef with flamboyant taste in textiles falls inexplicably in love with a repressed Italian bank clerk with daddy issues, and through him falls explicably in love with Venice. For me, de Blasi just couldn't quite convey why she was attracted to her stranger. She herself seems like a glorious broad who I'd love to go drinking with, but he remained a mystery. But then, this is a memoir, not a romance, and other people's relationships are often a bit baffling. I never understand how people who really like food end up with people who don't much care what they eat. 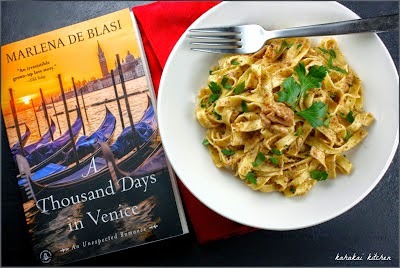 Although I love the book, her statements are truly apt and I would like to share a glass of wine with de Blasi as well. Alicia decided on Seafood Risotto, a perfect dish to celebrate a book about Venice. When it was not raining I prowled the Rialto Market, fascinated with its glorious riot of vegetables and freshly caught seafood. I wandered the dank callees and discovered the local wine bars, among them, Vino Vino, which is mentioned in the first pages of the book. It was near my hotel and became my favorite place to stop by for a warming glass of red wine and nibbles of the appertivos lined up behind the glass window. With only a dozen seats and flanking a canal, the place offered a cozy respite from the damp chill outside. Deb at Kahakai Kitchen (another co-host) was drawn in by the meal that Marlena cooked for Fernando when she visited her in The States: Talgiatelle con Salsadi Noci Arrostite (Pasta with Walnut Sauce). Deb, I almost chose this one, too. I think her description of "The Stranger" is dead on. I also think she nailed her dish. Joanne at What's on the List? 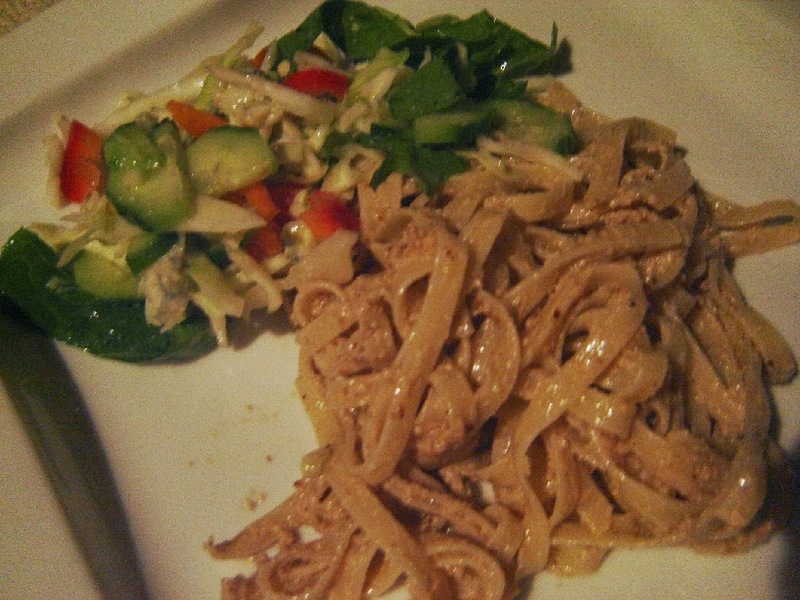 Also made Fresh Pasta with Walnut Sauce. Joanne loved the book and has even read it multiple times. She says,"I am a sook (Aussie lingo for a softie in a good way) when it comes to romance.” She does question Marlena’s decision to fall in love and move to another country as being a bit extreme. If Marlena was your friend, would you think her decision was a bit strange or “as a friend,” would you be supportive of her decision each and every step of the way? Joanne also is dying for this book to be made into a film and asks her readers who should be cast in the title roles. My vote is Helena Bonham Carter for Marlena. Woody Allen for “The Stranger”??? 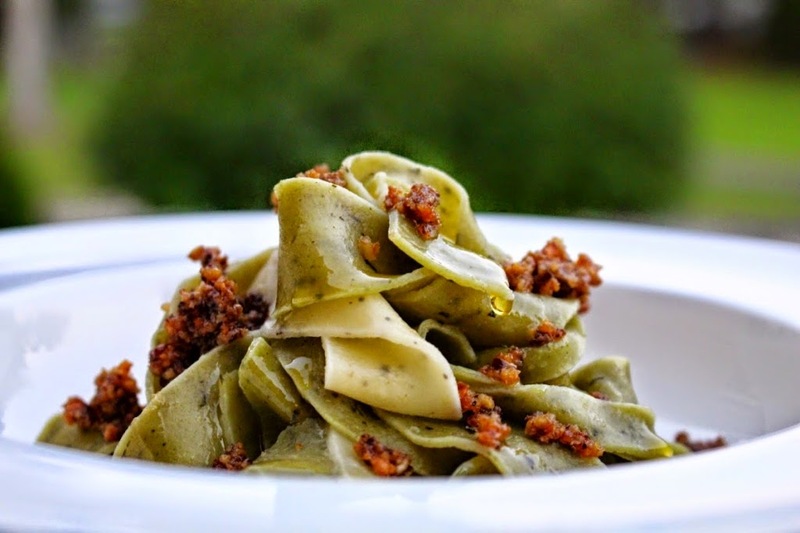 Here is Joanne's inspired dish: Fresh Pasta with Walnut Sauce. 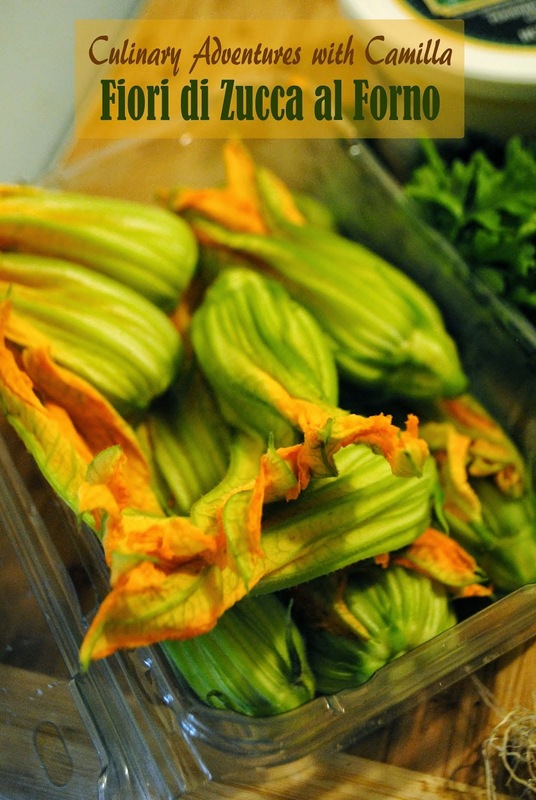 Claudia from Honey from Rock was also inspired by this same recipe. I definitely think three votes for Walnut Sauce means I must try this dish out soon. I especially appreciated it as a later-in-life love story, being later-in-life myself, as well as a sucker for lovely fairy tales come true. And, so descriptive, so well written. The woman is a poet. I, however, think Claudia might just be the poet. Life is not completely perfect, a real fairy tale has an underside. Melding cultures and personalities is never easy, especially for mature folks, set in their ways. Which is actually a good thing. A jolting out of ruts and character flaw stagnation, into something better, new and stronger, without either partner becoming diminished. Marriage is meant to do that, and beautiful when it does. Here is her rendition of de Blasi's Walnut Sauce. Rachel from The Crispy Cook enjoyed the book. Marlena seems a larger-than-life character and has a bit of bravado, after suffering a tortuous first marriage and a "grim childhood, scattered here and there with the hideous". As a fellow romantic, I rooted for her to make things work with Fernando and sighed with pleasure when they did. It was not a shudderingly violent sort of love affair, but one that was quiet and sure: "Now all the doors are open, and there is a warm yellow light behind them." Ah. 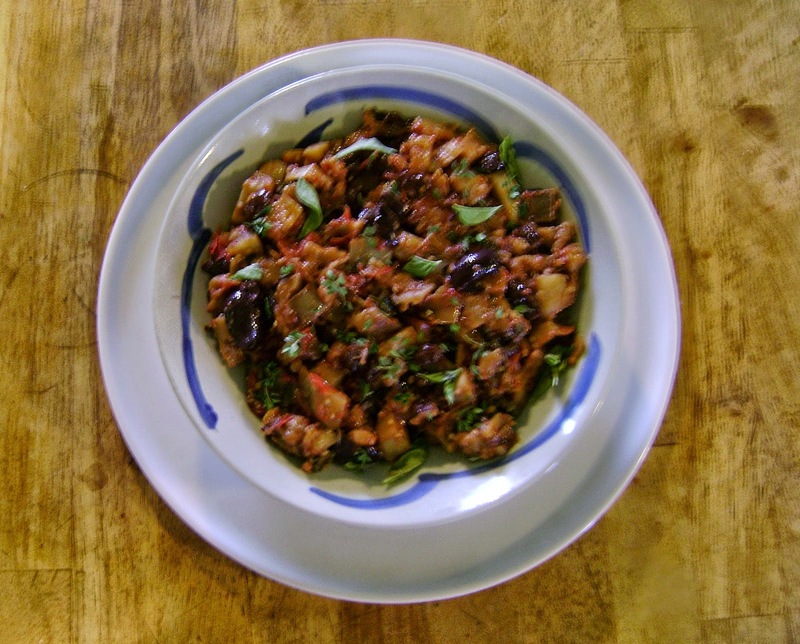 Rachel drew inspiration from both Southern Italy and her fall garden where she found “white eggplants, parsley, tomatoes, garlic, onions, and basil” for her caponata (or what she calls Sicilian version of Ratatouille). As Camilla is always the first to post, I am usually the last. 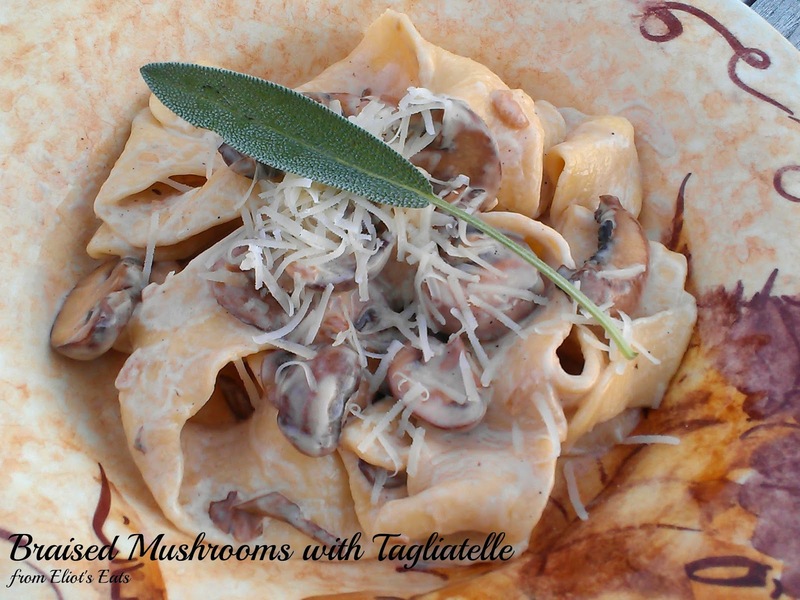 I made Braised Mushrooms with Homemade Tagliatelle (based on de Blasi's "Wild Mushrooms in Late-Harvest Wine"). My pasta did not turn out as beautiful as Simona's nodi, but this sauce is unbelievable. To sum up, I think some of us "more seasoned" readers identified more with de Blasi even though we were all a little confused about the attraction. I think we all loved her descriptions of Venice and the food references and recipes. I leave it to you whether or not you follow the rest of Marlena and Fernando's adventures in Italy as chronicled in her other books. Again, thank you for participating in this round of CTB. Please join Cook the Books for the October/November selection: That Old Ace in the Hole by Annie Proulx and hosted by Simona of briciole. I started this book as soon as Simona announced her selection and I have to say, "I LOVE IT." 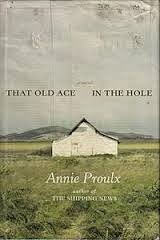 I love Proulx' writing style and the description of the scenery of the Texas and Oklahoma panhandles. But, I have said enough. Ciao, until we meet again to discuss it all.